It looks like Santa's workshop at my kitchen table... I've been making more paper ornaments. Who knew I would turn out to enjoy paper folding as much as rolling? Not me! There's another project underway too, but it will have to wait until after Christmas to be mentioned here because, you know, surprises. Meanwhile, I'll show you three batches of cards I ordered (bartered actually, in exchange for ad space) from Etsy sellers who are just da bomb! I was thrilled when Debbie Iverson of Lemon Street Handmade in Pennsylvania said she would enjoy trading. I can't show everything she sent, because again, Christmas, but the variety of her items is gorgeous and everything arrived in beautifuly wrapped, eco-minded packaging. 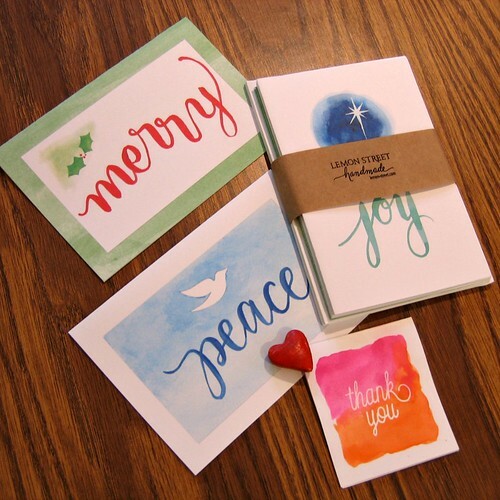 The holiday cards are printed from Debbie's watercolor paintings, the Hello card and thank you are original watercolors, and I love the Valentine and little paper mache heart magnet that she tucked in as extras. 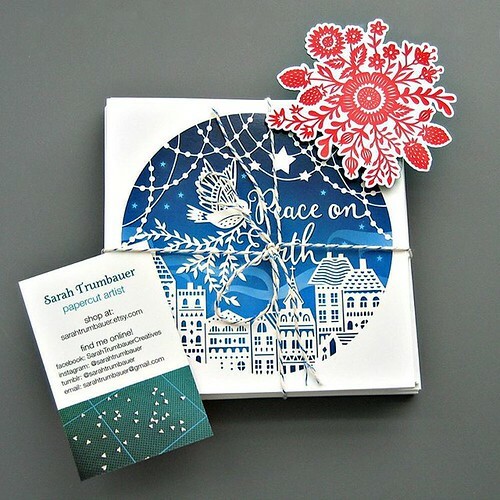 Sarah Trumbauer in Maryland creates beautiful paper cuttings. 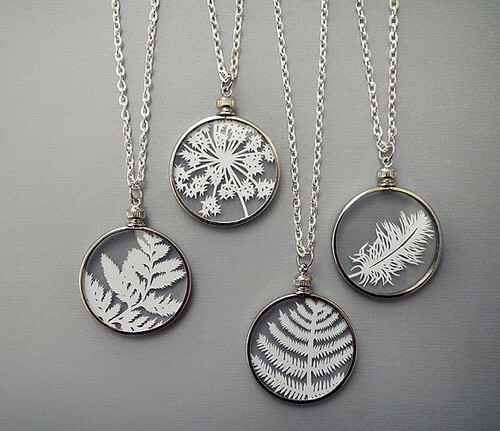 I gave my daughter-in-law one of Sarah's hand cut fern necklaces for her birthday, and she was amazed at its super-fine cuts. The pendants with an original cutting placed between two layers of glass are only 1.25 inches (32 mm) in diameter! 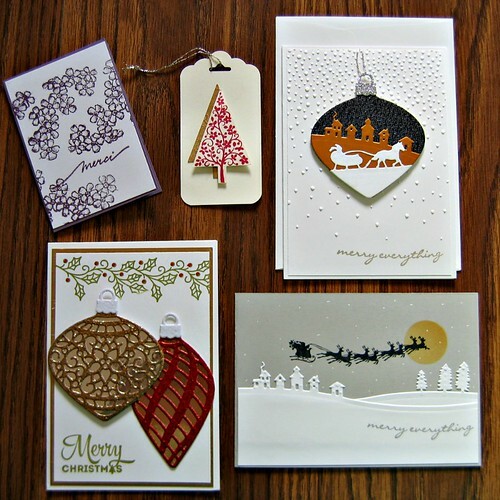 These printed Christmas cards and floral burst magnet from Sarah's original papercut illustrations are so pretty too. Even the envelopes are special with a self-stick strip so sealing is an absolute snap. 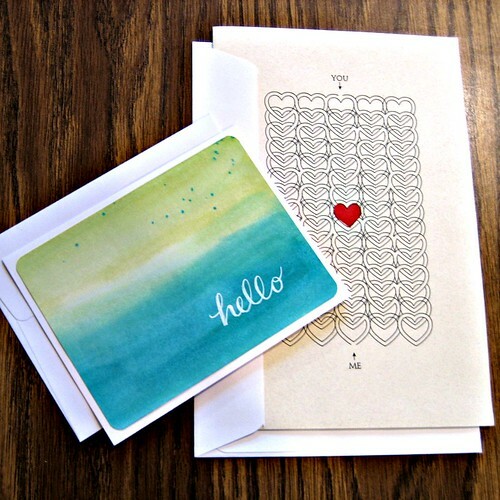 Both are available in her Etsy shop, Sarah Trumbauer, where she offers prints, ornaments and more. Karen of Maudie Maudie in France made these pretty stamped and layered cards and tags, and wrote such a nice thank you note. Her shop is filled with cards for many occasions, definitely not just Christmas, so keep her in mind no matter the time of year... the same goes for all of these shops. 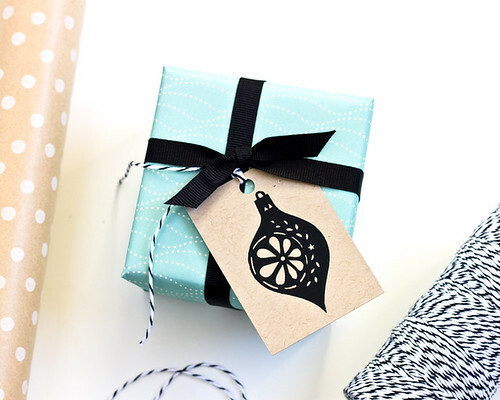 Lastly, I received these fab wrapping papers and gift tags from Casey Starks of Vitamini Modern in California. 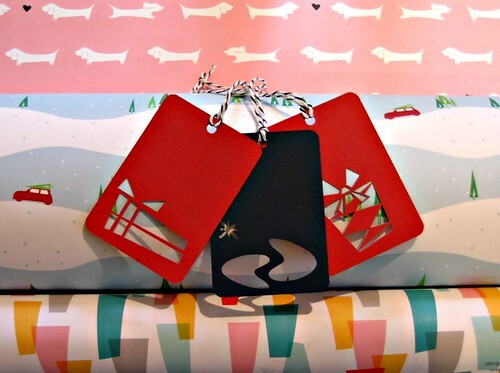 I love her style and have two MINI owners on my gift list so the snowy-cars-with-trees paper is guaranteed to be a hit, as will the adorable dachshunds and retro trees. Casey is sold out of the red and navy laser cut tags, but equally stylish vintage ornament designs are available. Today is your last day to order for Christmas delivery in the U.S., but she has accessories, fabrics, calendars, and housewares that are perfect all year round. I hope you'll enjoy these final days of shopping, wrapping, baking, et al! Wow, I love those pendants! Amazing cutting skills required for those beauties! I know what you mean, Sue. Truly remarkable! Beautiful ideas for Christmas gifts! I'm glad you liked them, Suzana. Happy holidays to you too!